In four days at Addis Ababa University, we educated more than 50 health care providers on basic neonatal resuscitation. These individuals spanned the spectrum from new pediatric nurses and labor-and-delivery scrub nurses, to neonatal nurses with decades of experience, to midwives, to pediatric residents. What we discovered was a commitment to excellence and a dedication to providing the best patient care possible, even in a resource-poor environment. The baseline fund of knowledge in addition to the intellectual curiosity of the group impressed us. There was a drive and a passion to learn that spoke for itself and was manifest in insightful questions, enthusiastic interaction, and a resistance to let us leave at the end of the day. 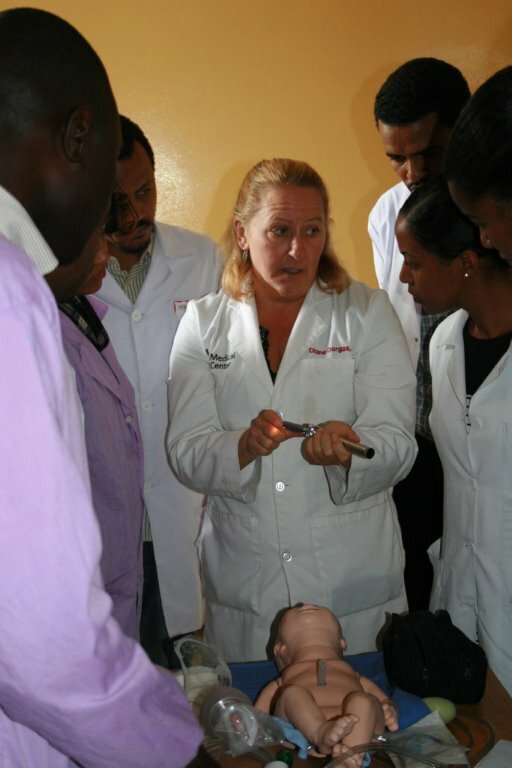 Diane Gorgas demonstrates advanced resuscitation techniques at the Black Lion Hospital in Addis Ababa. The refresher training began by framing the need for this knowledge and skill set. The Black Lion Hospital in Addis Ababa is the premier teaching and patient care site in this country of 92 million people. About 3,000 deliveries a year take place at the hospital. Being a tertiary care referral center, these are disproportionately more complicated and higher risk pregnancies than the general population. Within an average, healthy population, 10% of babies will require some sort of support at delivery. In this high-risk population, estimates can be as high as 30-40% of newborns who will require resuscitation. Our training started with a definition of the scope of the challenge, and nurse-midwife Sharon Ryan, CNM, DNP, discussed both maternal and labor and delivery risk factors which may compromise a newborn and necessitate resuscitation efforts. Monica Terez, RN and life-time neonatal nurse took over and outlined the equipment needs and basic resuscitation algorithm for a newborn, including ventilator support through bag valve mask and chest compressions. I finished the training with a discussion of more advanced resuscitation techniques including intubation and vascular access. The training received high praise for its interactive nature, and for the hands-on experience it afforded all the learners. Ethiopia is a book-rich culture. They are an exceedingly motivated, bright, and industrious people who are struggling with the challenge of every developing country: how to educate and train its best yet retain them in country and not lose out to the developed world’s insatiable appetite for experienced health care workers. The “brain drain” of trained physicians and nurses from Ethiopia to the U.S. and Europe is real. We have heard estimates that there are currently more Ethiopian-born physicians practicing in Chicago than there are in the entire country of Ethiopia. This creates a practitioner experience vacuum. Practical, clinical training is difficult to sustain as senior clinicians are wooed away to greener pastures, leaving the young to train the young. The One Health Initiative is an excellent start towards bridging this gap, and the possibility of the three of us traveling to Ethiopia as supported by the Greif Foundation is making strides at providing these valuable experiences.